One of the things that makes the internet so revolutionary is the lack of government control or censorship. 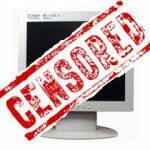 It looks like that’s changing however as some british ISP’s such as Sky, Talktalk, Virgin and BT have started to censor their customers internet usage. Simply use the alternative domain name: www.thepiratebay.ee. 2. Paste in “194.71.107.81 www.thepiratebay.se” without the quotes and save. Restart your web browser and access to the pirate bay should be restored! 1. Subscribe for access to a proxy server from a site such as yourprivateproxy.com. 2. Once registered, you will be given an IP address, port and username/password for your proxy. 3. Enter your proxie’s details into the ‘Prexy Server’ page of your web browser’s settings. 4. Enjoy censorship free internet browsing! Both of these methods still work at the time of writing on a Sky connection. I’d love to hear whether they work or not on other ISP’s. The best method of combatting internet censorship in the long run is to file a complaint with your ISP stating clearly that you are against internet censorship of any kind and that you will be moving to a provider that does not censor their customers web activities. Make sure you follow through and move to a company that cares about it’s customers rightsand freedom.